VF Bioscience was established in 2011 to develop innovative functional ingredients and food supplements, with a strict commitment to quality and efficacy. Our research focuses on the identification of new probiotic strains, active bacterial metabolites and fermentation products. Through strategic scientific and commercial partnerships, we have extended our product portfolio to several selected, patented plant extracts. Applications of VF Bioscience products include prevention of cardiovascular and metabolic disorders, immune support, improvement of mood and cognitive function, bone health maintenance… All ingredients are exclusive, designed to provide optimal support for health and wellbeing. We are located in France on the Lille-Eurasanté bio-business park, at the heart of a major European medical and academic cluster. On this site entirely dedicated to healthcare activities, academic hospitals, universities, research institutions collaborate with biotech and nutrition companies to develop innovative solutions for today’s health challenges. VF Bioscience is a member of the “Nutrition Health Longevity” competitivity cluster and carries out collaborative R&D projects with local academic laboratories. 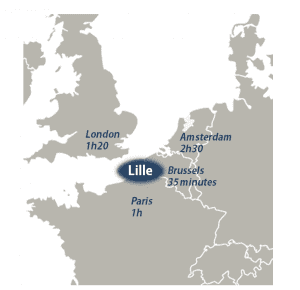 Lille is also a strategic location with easy access to major European cities: Paris, London, Brussels, Amsterdam… 100 million consumers live within a 300 km radius. Thanks to strategic partnerships with leading universities, biotech companies and food supplements manufacturers all over the world, we have achieved a global presence and sell our exclusive products in more than 30 countries in Europe, North America, Asia and Oceania. Our Miami-based subsidiary, VF Bioscience USA, develops products for the North American market. These products are based on the same, exclusive lactic acid bacteria strains than the European products.